Members of the Church of Jesus Christ of Latter-Day Saint believe that the priesthood is the authority to act in God’s name delegated from God to man. When Jesus Christ lived on the earth, He gave the priesthood to His Apostles. After Jesus Christ’s crucifixion and the deaths of the Apostles, members of the Church believe that the fulness of Christ’s gospel, including the priesthood, was taken from the earth (see “Restoration of the Priesthood,” gospeltopics.lds.org). 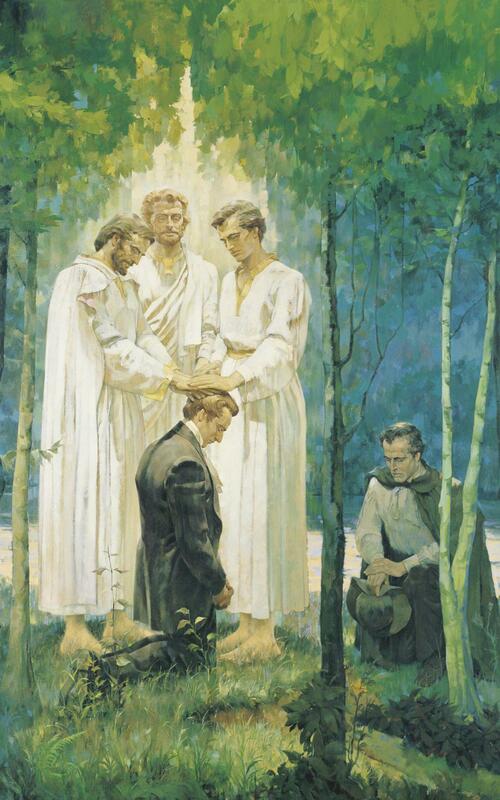 Members of the Church believe that in 1829, the priesthood was restored to the earth when heavenly messengers conferred it upon the Prophet Joseph Smith. To Members of the church of Jesus Christ of Latter-Day Saints , the restoration of the priesthood is an important event in the history of the Church. What do Members of the Church believe about the priesthood? Members of the Church of Jesus Christ of Latter-day Saints believe that there are two different priesthoods (see D&C 107:1)—the Aaronic Priesthood and the Melchizedek Priesthood. Members of the Church believe that the Aaronic Priesthood is the lesser, or preparatory priesthood, and the Melchizedek Priesthood is the greater priesthood. Joseph Smith learned about the Aaronic Priesthood after finding mention of baptism for the remission of sins during his translation of the Book of Mormon. On May 15, 1829, Joseph and his scribe, Oliver Cowdery, went to the woods to pray about what they had read about baptism. In response, John the Baptist descended from heaven and conferred the Aaronic Priesthood, which includes the authority to baptize, upon Joseph and Oliver (see Joseph Smith—History 1:68–72). Today, the Aaronic Priesthood can be conferred upon worthy young men when they begin their 12th year. In fact, followers of the Church believe that there are several different offices within the Aaronic Priesthood, each with its own responsibilities. These offices include deacon, teacher, priest, and bishop (see D&C 107:13–14, 85–88). Priesthood holders progress to higher offices as they progress in the gospel. The duties of various offices in the Aaronic Priesthood include blessing and passing the sacrament, baptizing, and overseeing the temporal needs of Church members (see “Aaronic Priesthood,” gospeltopics.lds.org). Members of the Church of Jesus Christ of Latter-day Saints believe that the Melchizedek Priesthood, or the greater priesthood, was also restored through the Prophet Joseph Smith. The exact date of the restoration of the Melchizedek Priesthood is unknown, but it occurred several weeks after the restoration of the Aaronic Priesthood in 1829 (see Doctrine and Covenants and Church History Gospel Doctrine Teacher’s Manual , 45). The ancient Apostles Peter, James, and John appeared to Joseph and Oliver and conferred the Melchizedek Priesthood upon them. Members of the Church believe that the Melchizedek Priesthood can be held by worthy adult male members. The Melchizedek Priesthood is named after Melchizedek, a great high priest in the time of Abraham (see D&C 107:2–4). This priesthood includes the authority to give special priesthood blessings for comfort, counsel, and healing and the authority to bestow the gift of the Holy Ghost. In fact, members of the Church of Jesus Christ of Latter-day Saints believe that in the ordinances of the Melchizedek Priesthood, “the power of godliness is manifest” (D&C 84:20; see also “Melchizedek Priesthood,” gospeltopics.lds.org). Members of the Church of Jesus Christ of Latter-day Saints believe that the restoration of the priesthood in May 1829 is not only a historical fact but also a miracle and an incredible blessing for all of God’s children. To learn more about the restoration of Christ’s Church, visit ChurchofJesusChrist.org.